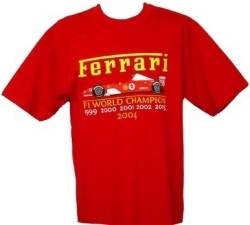 Ferrari Six Times World Champions T-Shirt, Red -- LIMITED EDITION. Come and celebrate Ferrari's F1 Constructor's Title with this great red tee shirt. Ferrari T-Shirt - Six Times World Champions - Red - LIMITED EDITION ! !